On a recent Microsoft Dynamics GP newsgroup post, a user created a Smartlist Builder based on a SQL Server view. After granting permissions to the DYNGRP database role, the Smartlist was still not accessible to the end user. After testing a few things, fellow MVP Victoria Yudin was able to resolve the problem by assigning a specific Smarlist Builder security task to the user's Dynamics GP role. The following steps are needed to recreate the issue. 1) Run the following statement against your SQL Server company database. This simple view will show all contact information on sales documents that have been purchased from suppliers. 2) Login to GP as SQL Server's system administrative user (sa) and open Smartlist Builder SQL Table Security window and grant access to the created object. Choose the Views radio button to display the recently created view. Click OK to continue. NOTE: Use the SOPNUMBE and PONUMBER fields as keys to the SmartList. 4) Save and open Smartlist to build the newly created object. 5) For this demonstration, grant access to the newly created Smartlist by assigning security to the DEFAULTUSER security task. 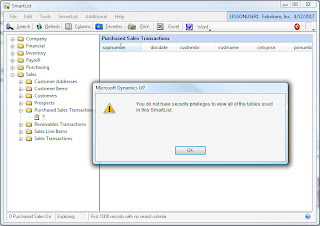 Go to Microsoft Dynamics GP > Tools > Setup > System > Security Tasks. 6)Switch users. Select a user with DEFAULTUSER security task and log on as that user into GP. For this sample, I will be using LESSONUSER1 in Fabrikam. 1) Log into Dynamics GP as SQL Server systems administrator (sa). 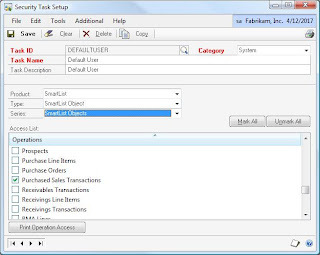 2) Open the Security Task Setup window and choose the task ID. In the case of this example I selected DEFAULTUSER. Under Product, choose SmartList Builder; under Type, choose SmartList Builder Permissions; and under Series, choose SmartList Builder. 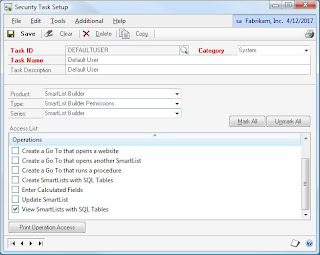 Mark View SmartLists with SQL Tables in the Access List pane. Click Save to continue. 3) Log on as the user in question (LESSONUSER1), then attempt to open to launch the newly created SmartList. At this stage, the security issue should have been resolved and the user is now able to view the Smartlist. I am having the same permission issue when trying to import a SQL view based smartlist from another machine. I have done all the steps mentioned by you and infact granted permissions for all SQL objects on TWO and DYNAMICS, but still get the error. 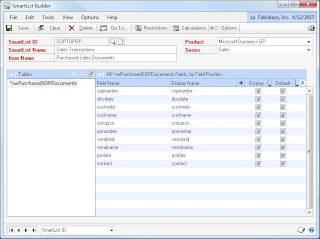 Make sure you create the SQL view in all company databases. Edit the XML file and change any reference to a non-existing database, to any of the databases currently available in your customer environment. This should work!